The lurking progeny of the Great Mother, the Eternal Womb, the Black Goat… they lurk in wait. 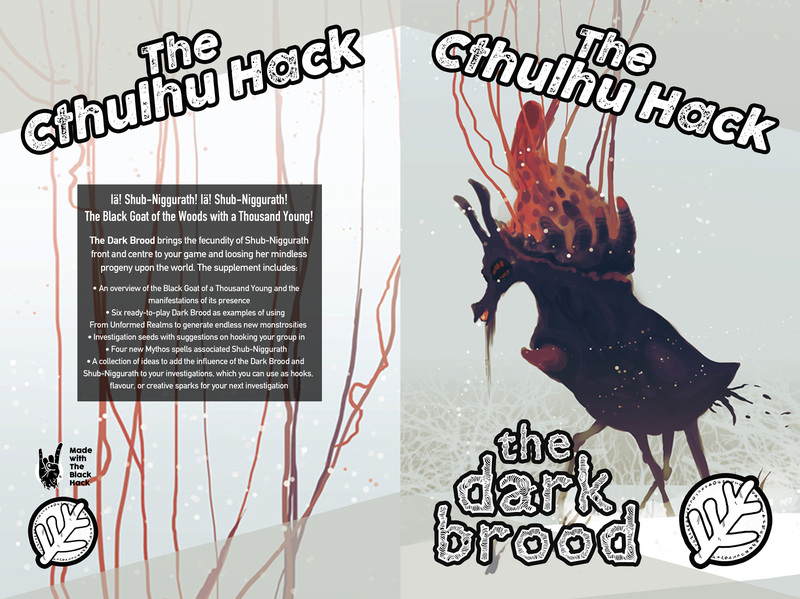 I have work to do to complete the text of The Dark Brood and I have my fingers crossed that I can complete the task in the scant time that remains. However, for the moment, there’s a cover image ready and prepared for sending on to the printer. Once all the work has been completed, the PDF will also get an update on the OneBookShelf sites. Hang in there with me. I appreciate your patience and your support. Remember that almost all the core books and adventures, as well as the bundles, are on sale and have a discount on them through the month of May at RPGNow and DriveThruRPG. And, as with the Core Book, incremental upgrades and expansions of books you have already purchased will come free once I’ve completed them. Those who picked up the Core Book in May 2015 have just had the revised v1.6.6 version dropped in their Library for download. Until I do a complete revamp and expansion, I’m right there supporting your gaming, with a developing system that remains true to the desire for fast and simple horror investigations in Lovecraft’s universe.